Description: ""Love your neighbor"" is the central obligation of Jewish life. Mussar, a late nineteenth-century Jewish renewal movement, focused on this precept as a means of self-improvement and spiritual growth. Through the practical applications of Mussar, one can learn how to awaken to a spirituality that is compassionate, moral, and generous. In this book, Rabbi Ira Stone provides a contemporary theological framework for understanding Mussar and describes how participation in a Mussar group can offer support and guidance for this powerful spiritual practice. Endorsements: ""This book is a marvelous gift to a generation seeking new spiritual paths in order to live a richly Jewish and deeply human life. Ira Stone uncovers a neglected treasure in modern Judaism, the nineteenth-century Mussar movement, which sought to develop the human being into a mensch by reuniting mitzvot and morality. 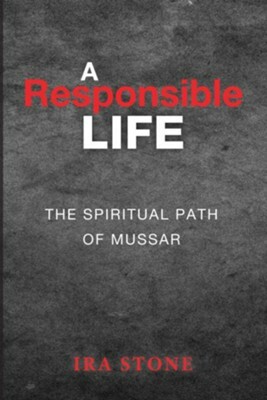 Stone gives us his postmodern theology of Mussar, and guides us through its theory of the process of self-development using its methods of self-improvement. In a final tour de force Stone shows how, in the mode of Mussar, prayer and halakah awaken our spirit and teach us to concretize God's love and our love for fellow human belngs. This book is a treasure to be read and reread."" -Rabbi Irving Greenberg, President, Jewish Life Network/Steinhardt Foundation ""Sometimes we know how to act morally but we lack the strength of character or motivation to do it. The Mussar movement developed in Judaism to help us do what we know is right. This book is a wonderfully clear and helpful exposition of one form of Mussar. As such, it has the power to do nothing less than improve our moral character and change our lives for the better."" -Rabbi Elliot Dorff, author of To Do the Right and the Good ""Here you will find hidden gems of the authentic, time-tested Jewish spiritual tradition of Mussar--and be shown steps you can seek to open your own heart. Rabbi Stone passionately reminds us that when we extend our hand to help another bear her burden, the pathway to the Beloved we seek opens before us."" -Alan Morinis, author of Climbing Jacob's Ladder ""Ira Stone gives us a lucid and thoughtful account of the writings of the great Mussar teachers. His passion and compassion are apparent on every page, as he conveys his vision of a contemporary Jewish ethical practice. This book deals with vital issues, such as the spiritual imperative of responsibility for the other in a way that is both philosophically cogent and accessible. A fine study. -Avivah Gottlieb Zornberg, author of Genesis: The Beginning of Desire About the Contributor(s): Ira F. Stone is rabbi of Temple Beth Zion-Beth Israel in Philadelphia and founder of the Philadelphia Mussar Institute. He has taught at the Jewish Theological Seminary and currently teaches at Recontructionist Rabbinical College. Rabbi Stone is the author of Seeking the Path to Life, Reading Levinas/Reading Talmud, and two volumes of poetry. I'm the author/artist and I want to review A Responsible Life.